Thuto and Seabelo attend Eduplex, a parallel medium mainstream and inclusive school which caters for both normal hearing and a small number of hearing-impaired learners. Started in 2002, Eduplex is a mainstream school which offers the opportunity for hearing-impaired children to be included in the classes (three to four deaf children per class). Making use of the latest medical technology (cochlear implants, hearing aids and FM communication systems), the help of classroom assistants, as well as access to speech and language therapists and audiologists, Eduplex offers hearing-impaired children exceptional facilities to aid their success. With a holistic approach to education, Eduplex helps all their children to reach their full potential. Many school activities, as well as the sports and music centre, provide the children with a well-rounded education. Eduplex also offers Speech Therapy & Audiological support for learners with hearing loss as well as for their families. 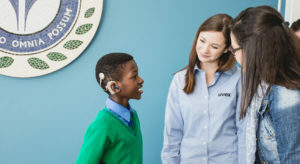 Eduplex Audiology also offers mapping services for learners with cochlear implants and Eduplex makes use of the FM and classroom amplifi­cation technology to assist hearing-impaired students. The two children whom uvex South Africa and the Rainer Winter Foundation sponsor both have profound hearing loss. Profound hearing loss means that without hearing instruments one can only hear very loud sounds like that of a jack hammer or the ­ring of a gun. Thuto, was diagnosed with profound hearing loss by the age of 3 and was fi­tted with top of the range sponsored hearing instruments. Seabelo, contracted Meningitis at the age of 2 ½ resulting in his profound hearing loss. With the help of sponsorship Seabelo received a Cochlear implant in 2012. 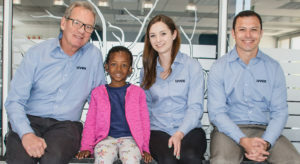 Both uvex South Africa and the Rainer Winter Foundation are delighted to be working together to help improve the lives of these two children at this extraordinary professional institution. The sponsors will be following the children’s progress closely as they advance through Eduplex and life.